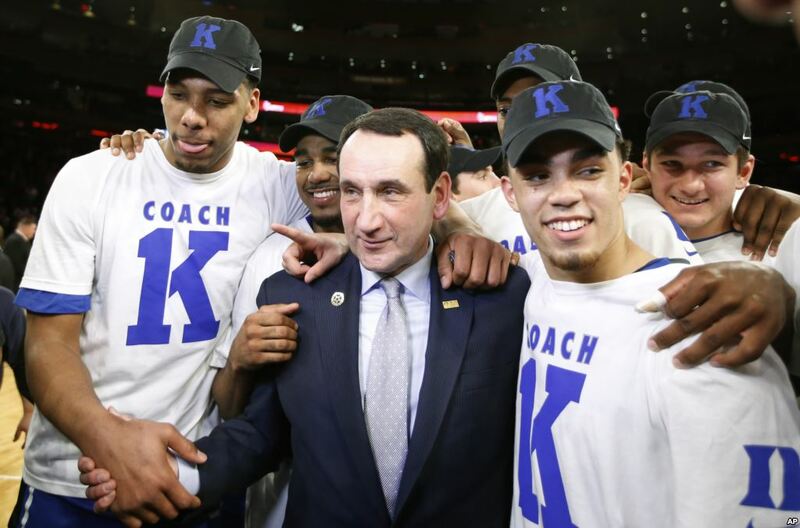 With Monday night’s fifth career NCAA Championship, Mike Krzyzewski’s legacy took another long stride into the history books of the college game. In what he has called the most enjoyable season of his 40-year coaching career, Kryzyzewski showed his versatility as a head coach by leading Duke to the greatest of heights by utilizing a makeup unlike any of his previous champions. The 68-year old deserves all the credit he has received for his prolonged success, winning in three completely different eras of the sport by adapting to the standards of the times. His first two title teams (1991 & 1992) were won when programs could be built around long-term stars like Christian Laettner, Bobby Hurley and Grant Hill. When his 2001 team, led by Shane Battier, Jason Williams and Mike Dunleavy, Jr., won Krzyzewski’s third championship, the lure of the NBA had gutted much of the young talent from the college game. The last decade has brought the one-and-done rule to college basketball, and at least initially, Duke did not seem to be an interested party — Krzyzewski’s 2010 national champs featured five upperclassmen starters. 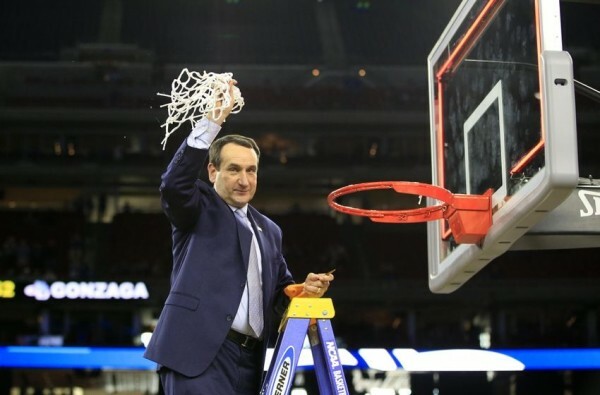 It was a year of milestones for Coach K — his 1,000th win and fifth national title. 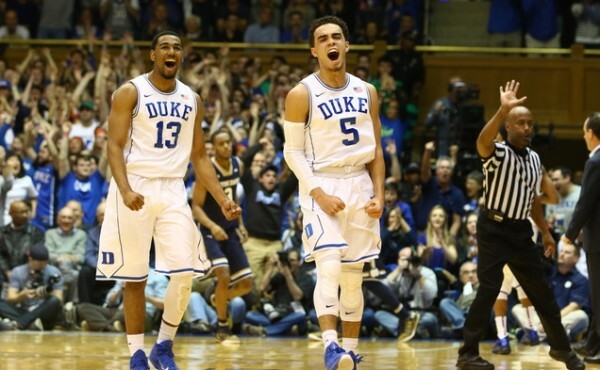 Since that fourth national title, the Blue Devils had crashed and burned with their last two high-profile freshmen — Austin Rivers (2012) and Jabari Parker (2014) were unwilling participants in huge NCAA Tournament upsets of Duke by Lehigh and Mercer, respectively. 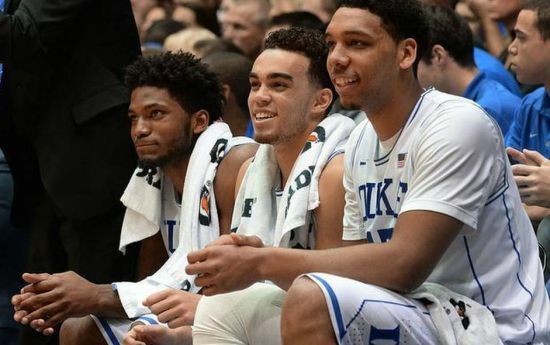 Theirs were the reference points going into a campaign when Coach K welcomed the nation’s top recruiting class of Jahlil Okafor, Tyus Jones, Justise Winslow and Grayson Allen by signaling that he was all-in with the modern recruiting strategy focusing on one-and-dones. Krzyzewski masterfully molded the young Blue Devils around an elite offense and a gradually improving defense all the way to another championship run. Tom Izzo’s team has done things this March that Tom Izzo’s teams seem to do every March. One Michigan State postseason streak, however, has yet to continue. In each of the last 14 seasons, Tom Izzo’s Spartans have lost an NCAA Tournament game. What was once thought to be Duke’s weakness has suddenly become its strength in NCAA Tournament play. In fact, the Blue Devils have been so defensively stifling that none of its four opponents in the South Region were able to crack 60 points against them. So what’s behind Duke’s big turnaround on that end of the floor? Let’s take a look at some key defensive numbers from the last two weeks and compare those with its previous 21 games — beginning with when conference play tipped off on January 3. In its four NCAA Tournament games so far, Duke has reduced its opponents’ scoring by a whopping 15.0 points per game and 16 percent fewer points per possession. Duke’s sudden surge of defensive stinginess is related to two improvements: 1) better success in forcing opponents to miss shots (from both two- and three-point range); and 2) keeping teams from getting to the free throw line. At first glance it would appear that a markedly slower tempo (four fewer possessions per game) might be helping the Blue Devils’ defense, but that assumption could be somewhat deceiving. NCAA Tournament opponents are attempting only one fewer field goal per contest and turnovers and offensive rebounds have remained about the same as they were before. That means that the slowdown is almost entirely caused by the Blue Devils move from rarely fouling to almost never fouling. Opposing teams are averaging fewer than 10 free throw attempts per outing in the NCAA Tournament. RTC National Columnist Bennet Hayes is in Houston this week for the South Regional semifinals and final. Offenses Fail To Get Going, Again. In Friday night’s regional semifinals, four teams that began the night among the 65 most accurate three-point shooting teams in the country combined to shoot 23 percent from long-range. Much was made of the clumsy dome setup inducing the offensive malaise, but the forecast for Sunday was still for efficient offense by the bucket-load, given the firepower Duke and Gonzaga brought to the table. The two teams got off to a fast start – 22 points in the first five minutes – but things settled down significantly from there on out. Gonzaga and Duke combined to shoot 41 percent from the floor, including just 38 percent for the victorious Blue Devils. Duke did do two things extremely well offensively: shoot the ball accurately from three-point range (8-19) and maximize possessions (an amazing three total turnovers for the game). Gonzaga was less proficient in each category, making only two of 10 three-point attempts and turning the ball over 13 times. There were glimpses of the offensive brilliance we witnessed from both these teams all season, but this regional final never escalated into the explosive matchup many expected. Matt Jones, Who? Matt Jones. The Duke sophomore supplied the game of his life in this Regional Final. Jones, who entered Sunday averaging just 5.9 points per game, finished with 16 points (one shy of his season and career highs) and converted four of Duke’s eight made three-point field goals. With Quinn Cook and Tyus Jones again struggling to find the range from deep (combined 2-8 on three-point attempts), Jones’ unexpected scoring was crucial in getting the Blue Devils into the final minutes with a lead. Mark Few said afterwards that concerns about guarding Justise Winslow had led to Gonzaga to do a significant amount of cross-matching with Kyle Wiltjer defending Jones, a reasonable coaching decision that devolved into a disastrous result for the Zags. Jones, Duke’s fifth starter and a Texas native (like Friday night hero Justise Winslow) playing in his home state, was as important as any of his more acclaimed teammates Sunday afternoon. Wiltjer-Winslow Matchup. This was the matchup many fixated on in advance of Sunday afternoon, and with good reason: Winslow was coming off a scintillating Friday night performance, while Wiltjer has been arguably the Zags best player all season. Mixing and matching by both coaches saw both players spend a good deal of time defending elsewhere, but Wiltjer kept Gonzaga close in the first half, scoring 13 points on 5-7 field-goal shooting. Meanwhile, Winslow forced the action early and managed just five points in the opening frame, missing five of his six field-goal attempts. Things changed dramatically after intermission, however. Wiltjer struggled to get touches and was a virtual non-factor in the second half, while Duke’s freshman swingman found his Friday night form, pumping in 11 second-half points. Among the 11 was the biggest shot of the night, a three-pointer with the shot clock winding down and less than three minutes to go that put Duke up nine. Both players finished with 16 points, but Winslow’s big second-half was a key differentiator for Mike Krzyewski’s team. Star of the Game. Tyus Jones, Duke. 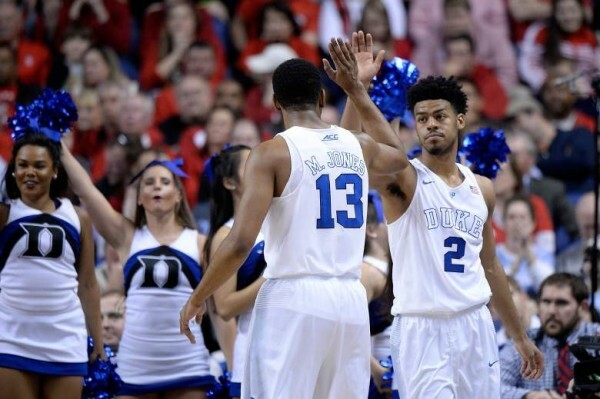 None of Duke’s big four – Jones, Winslow, Jahlil Okafor and Quinn Cook – played anything close to a perfect game today. Heck, they combined to shoot 15-45 from the field. Still, it was Jones that catalyzed Duke’s quick start, scoring seven points as the Blue Devils jumped out to a 17-10 lead. The South Region’s Most Outstanding Player finished the day with 15 points, six assists and no turnovers, helping Duke to that minuscule turnover total of three. Matt Jones’ unexpected scoring was a huge boost Sunday afternoon, but it was the more familiar Jones on the Duke roster who dictated this game’s flow from the outset. His ball-handling and all-around savvy will now be put to use in Indianapolis. Quotable. “It’s meant everything. Best team I have ever been on talent-wise and the best group of guys. We can look back and be pretty happy with what we have been able to do.” –Kevin Pangos, Gonzaga senior point guard, on what this Gonzaga season has meant to him. “It’s a shot he makes. It’s a shot he makes 499 times out of 500.” –Mark Few, on Kyle Wiltjer’s missed layup with 4:51 to go that would have tied game. Duke went on a 13-1 run to close the game after the miss. “This team is eight guys. There is not someone hiding in the locker room that is going to come out and appear.” -Krzyewski. Sights & Sounds. Whether it was the Sunday afternoon time slot, a Final Four bid on the line, or just the anticipation of the region’s top two seeds meeting, there was an urgency in NRG Stadium that never existed Friday night. The Duke faithful significantly outnumbered Gonzaga supporters (rough estimate — 5:1 ratio of Duke to Gonzaga fans), but enough folks from the Pacific Northwest made the journey South to create a back-and-forth feel to the cheering. In the end, however, the final image of NRG Stadium was all too familiar: Thousands of contented Duke fans standing in acknowledgment of a Blue Devil team advancing to face their next challenge. What’s Next? Duke advances to the program’s 16th Final Four, where it will take on Tom Izzo and Michigan State in Indianapolis. The fourth overall meeting between Mike Krzyewski and Tom Izzo in the NCAA Tournament will double as the second time they have met in a National Semifinal. Duke has won two of those three prior matchups, which includes a Sweet 16 game two seasons ago. On the other side, the loss to Duke ends what will likely go down as the greatest season in Gonzaga history. The Zags, now 0-2 all-time in the Elite Eight, will finish the year at 35-3. Mark Few loses Byron Wesley, Gary Bell and WCC Player of the Year Kevin Pangos to graduation after an undeniably special year in Spokane. Duke’s Dominant Defense. The Blue Devils made their way to Houston largely on the backs of a prolific offense but it was a disruptive defensive effort that fueled Friday night’s victory. In the Utah backcourt, Duke extended pressure and forced 15 Utes’ turnovers; when Utah managed to settle into the half-court offense they found the going no easier, as they made just 34.6 percent of their field goal attempts, including only 4-of-16 from behind the arc. 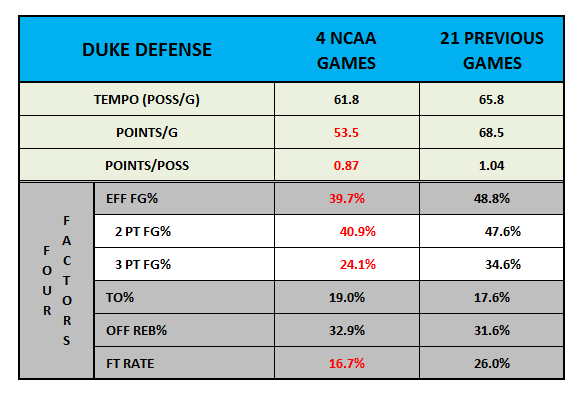 Over the course of the last two months, an improving Duke defense has often gone unnoticed while the hyper-efficient offense has whizzed on the other end. Today, however, there is no chance it goes overlooked — this was a varied and dynamic defensive effort against a good offensive team that earned Duke a trip to the Elite Eight. If similar efforts continue, that defense could take them even further. Delon Wright Never Gets Going. Utah’s indispensable senior star was whistled for an extremely questionable third foul with 4:59 to play in the first half, relegating him to cheerleading duties for the remainder of the period. In 13 first-half minutes, he managed only two points (on 1-of-5 field-goal shooting) without an assist. Wright was far more involved in the second half – he finished with 10 points, six rebounds and three steals – but his final contributions were still insufficient for the Utes to seriously challenge Duke. He missed 10 of his 14 field goal attempts, turned the ball over as many times as he set up teammates for buckets (two), and generally failed to penetrate the Duke defense. In totality, Wright’s senior season was spectacular – he was THE catalyst for Utah’s revival. But on Friday night, much like he was in other games down the stretch, Wright just didn’t measure up to the lofty standards his early brilliance helped set. Okafor Was Contained, But No Problem For Duke. Utah did a good job containing Duke’s freshman All-American, limiting Okafor to 3-of-6 shooting from the field while forcing him into four turnovers. Jakob Poeltl and Dallin Bachynski took turns as the primary defender on Okafor, but the Utes also brought a double-team immediately upon any Okafor touch, which served well in minimizing his impact. The good news for Duke: The Blue Devils learned they could win without a standout performance from Okafor. The bad news: Future opponents could replicate the Utes defensive plan of attack to make life difficult for him. Thinking to Sunday: Will Gonzaga leave Karnowski and Sabonis to battle Okafor one-on-one? Star of the Game. Justise Winslow, Duke. Winslow’s stellar first-weekend play carried over to tonight as the Duke freshman again stuffed the stat sheet. His final line: 21 points, 10 rebounds, two blocks and a steal. It wasn’t all good for Winslow – Brekkott Chapman beat Winslow for a layup while he was celebrating a made three-point field goal, much to the chagrin of Coach K – but the versatile wing again proved his immense value on Friday night. 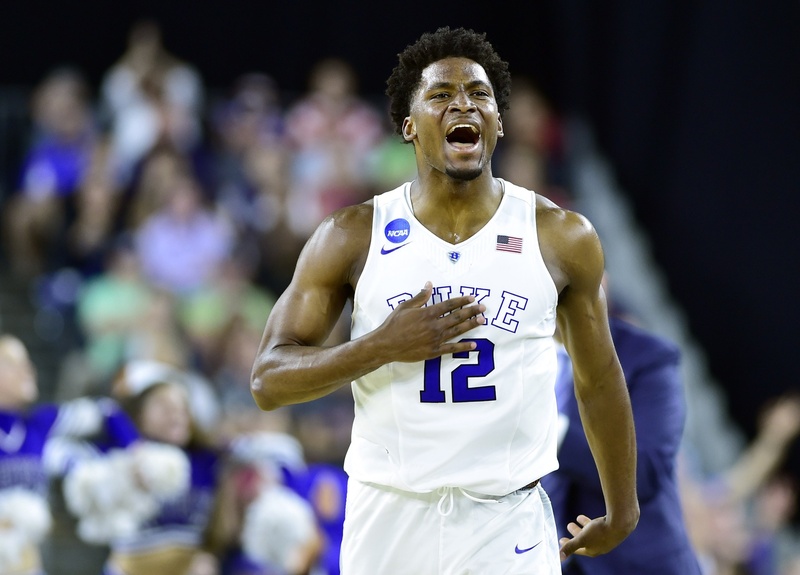 In an unusual twist, it was Winslow who hit all three of the Duke three-point field goals, finding the range on a night where teammates Quinn Cook and Tyus Jones could not. 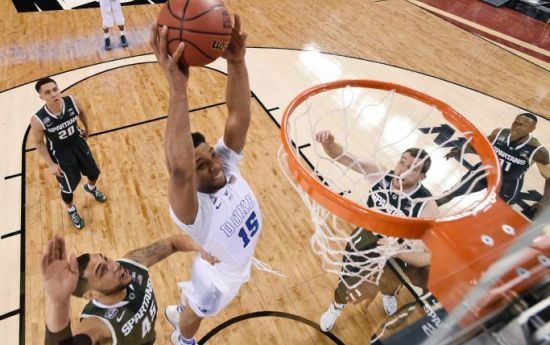 Fearing his athleticism, Utah dared him to shoot perimeter jumpers – Winslow made them pay. Your bracket is busted and the Sweet Sixteen is set. Let’s do a Regional Reset. Follow @rtcsouthregion for reporting from Houston this week. You can find all four regional resets here. New Favorite: #1 Duke. The Blue Devils are well-positioned to make their first Final Four since 2010. Two wins in Charlotte (by an average of 24.0 PPG) did little to diminish their status as the South Region favorite, even with Gonzaga and Utah also impressively advancing en route to Houston. Duke, 31-4 and trending upwards, has made clear the crown will go through them. Horse of Darkness: #11 UCLA. The only double-digit seed left standing in this NCAA Tournament is the South Region’s darkest horse, despite that double-digit seed owning more national titles than any program in the history of college basketball. UCLA’s serendipitous March has been well-documented, but 80 minutes of solid basketball earned the Bruins a trip to Houston and the second weekend. The impediment to advancement (Gonzaga) will be significantly greater in Houston; can UCLA’s mutation into Cinderella maintain itself for another weekend? Notre Dame absolutely dominated the first half. The Irish hit some unbelievably tough shots and made Jahlil Okafor try to beat them on his own. As a result, Duke’s other players went 4-of-16 from the field and committed seven turnovers. Notre Dame may be the only team in the country with five guys who can consistently hit shots (although Duke has some lineups that also fit that description). 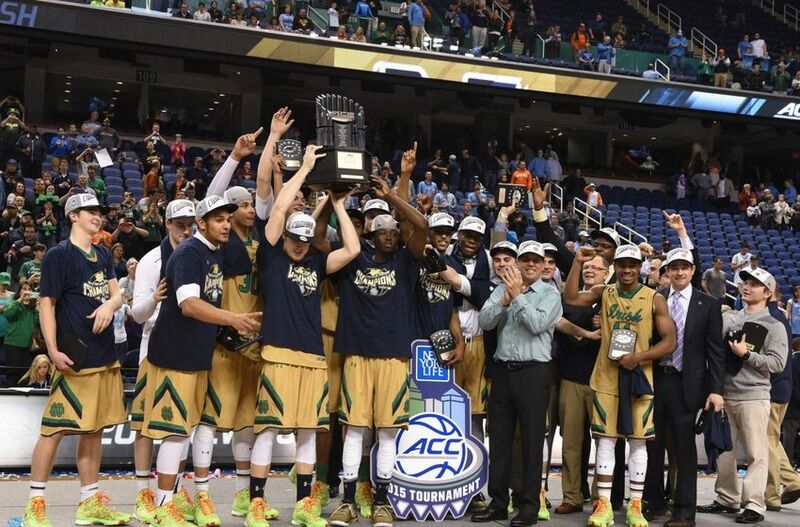 The Irish smothered Duke by forcing the guards to play deeper than usual and fronting Okafor. They also hit shots, lots of them. Mike Brey’s team had a total of five and-ones in the first half alone. Five. When Duke went to its zone, Bonzie Colson just crushed the Blue Devils from the high post. When they went back to man, Demetrius Jackson got to the rim with incredible ease. Even in the second half when Duke started making its eventual run, Notre Dame’s ability to get to the rim (and the free throw line) felt like the reason Duke never got it back to a single-possession game. 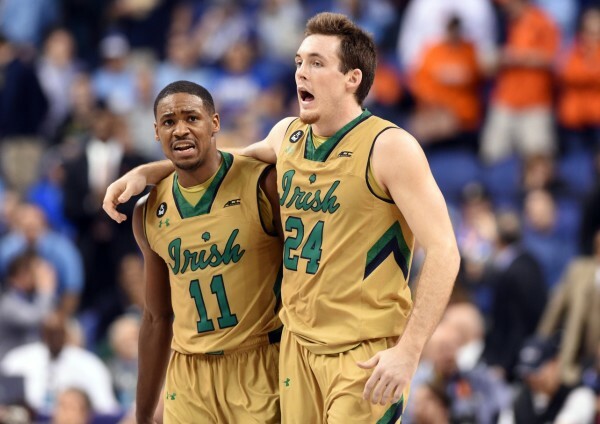 Demetrius Jackson is destined for great things. This may be an obvious statement (Jackson was a McDonald’s All-American, after all), but Jackson is a fantastic young player. He brings an athletic dimension to Mike Brey’s team that has been somewhat missing over the years. Jackson frequently broke Duke’s three-quarter court pressure like no one was there with his quick bursts of speed and playground dribbling moves in traffic. He also got to the rim with ease, finishing the evening with five assists and only one turnover in 39 minutes of action. If there’s a reason to still be bullish on the Irish next season without Jerian Grant, it’s because the sophomore Jackson is ready to take over the team. Mike Krzyzewski was remarkably calm. Coach K has a reputation of being curt and snippy in his pressers after Duke losses, but other than a defensive response to a question about last year’s team not meeting expectations, he was remarkably measured. I have a few theories on this attitude. The most likely idea is that he felt like Duke would have won the game if Quinn Cook hadn’t been gassed (Krzyzewski said on Thursday that Cook had been fighting off an illness). Cook went 1-of-10 from three on mostly good looks (0-of-8 in the second half) and he did a good job defending Jerian Grant, but it just looked like he wasn’t playing at 100 percent. The other theory is that Krzyzewski really liked the way Justise Winslow and Okafor fought back after horrible first halves.